started as a young seller of newspaper and yet, became a successful person by first job. Adelson was born and grew up in the Dorchester neighborhood of Boston, Massachusetts, a rough-and-tumble section of Boston, where his father drove a taxicab. Adelson was born into a traditionally Democratic family but became a staunch Republican as his wealth grew. "Why is it fair that I should be paying a higher percentage of taxes than anyone else?" he was reported to have once asked. He began making major contributions to the Republican National Committee following clashes with labor unions at his Las Vegas properties. Adelson divorced his first wife, Sandra, in 1988 and met his current wife, Miriam Ochsorn, on a blind date the following year. They were married in 1991. Miriam Adelson is a physician who directs the Dr. Miriam and Sheldon G. Adelson Clinic for Drug Abuse. Adelson fathered at least two sons, Mitchell and Gary. Both of Adelson's sons have struggled with drug addiction, Mitchell dying from an overdose in 2005.
the motivation of our family/ relatives in life leads us to lift up our job career. Sir Li Ka-shing, GBM, KBE (simplified Chinese: 李嘉诚; traditional Chinese: 李嘉誠; pinyin: Lǐ Jiāchéng, Jyutping: Lei5 Gaa1-sing4, Li2 Gia1-sêng5 gdr, born June 13, 1928), is a wealthy businessman from Hong Kong. He is the richest person of Chinese descent in the world, one of the richest and most influential investors in Asia, and the eleventh richest man in the world according to Forbes with an estimated wealth of $26.5 billion on February 11, 2008. Presently, he is the Chairman of Hutchison Whampoa Limited (HWL) and Cheung Kong Holdings in Hong Kong. Considered one of the most powerful figures in Asia, Li was named "Asia's Most Powerful Man" by Asiaweek in 2001. Forbes Magazine and the Forbes family honored Li Ka-shing with the first ever "Malcolm S. Forbes Lifetime Achievement Award" on September 5, 2006, in Singapore. In spite of his wealth, Li has a reputation for leading a no-frills lifestyle, and is known to wear simple black dress shoes and an inexpensive Seiko wristwatch. Li is also regarded as one of Asia's most generous philanthropists, donating over US$1 billion to date to charity and other various philanthropic causes. Li is often referred to as "Superman" in Hong Kong because of his business prowess. His peers in Hong Kong include Lee Shau Kee of the Henderson Land Development, New World Development's Cheng Yu-tung, Kwok family of Sun Hung Kai Properties, and Henry Fok Ying-tung, among others. Li Ka-shing was born in Chaozhou in the Guangdong Province, China in 1928. In 1940 the Li family fled to Hong Kong to avoid the turmoils in China. Li's family stayed at the home of his wealthy uncle. The arrogance of Li's uncle with his immense wealth ignited Li's determination to make a place for himself in the world. Li's father died in Hong Kong. Shouldering the responsibility of looking after the livelihood of the family, Li was forced to leave school before the age of 15 and found a job in a plastics trading company where he labored 16 hours a day. By 1950, his hard work, prudence and his pursuit of excellence had enabled him to start his own company, Cheung Kong Industries. From manufacturing plastics, Li led and developed his company into a leading real estate investment company in Hong Kong that was listed on the Hong Kong Stock Exchange in 1972. Cheung Kong continued to expand by acquiring Hutchison Whampoa and Hongkong Electric Holdings Limited in 1979 and 1985 respectively. Your intellectual capacity is your capital in your job. Oleg Vladimirovich Deripaska (Russian: Олег Владимирович Дерипаска) (born January 2, 1968 in Dzerzhinsk, Nizhny Novgorod Oblast) is a Russian billionaire, and a member of the Board of Directors of UC Rusal, a Russian aluminium industry company. Deripaska is the sole owner and a Chairman of the Supervisory board of Basic Element , a diversified investment company established in 1997 with assets in Russia and abroad. Basic Element's main assets are concentrated in six sectors - Energy, Resources, Manufacturing, Financial Services, Construction and Aviation. The major assets include UC Rusal, the world’s largest aluminium and alumina producer, Eurosib Power Company, GAZ Group automotive company, Soyuz Bank, Ingosstrakh insurance company, Aviacor aircraft manufacturer, SMR mining company, Continental Management Timber Industrial Company, Glavstroy and Transstroy construction companies, stakes in Strabag (25%), Hochtief (10%) and Switzerland based Fahrni (100%), etc. In 2007, Basic Element's consolidated revenues exceeded USD26 billion. The market value of the Company's assets is estimated at USD45 billion. Basic Element employs 300,000 people and owns companies in Russia, the CIS countries, Africa, Australia, Asia, Europe and Latin America. Deripaska is one of 16 global business leaders who drafted CEO Climate Policy Recommendations to G8 Leaders, a document outlining international business community's proposals to effectively tackle global warming. The proposals were signed by more than 100 of the world's leading corporations and handed to Japanese Prime Minister Yasuo Fukuda on June 20, 2008. G8 leaders discussed the recommendations during the summit in Japan on July 7-9, 2008. The process was coordinated by the World Economic Forum in collaboration with the World Business Council for Sustainable Development. In 2004, Deripaska was appointed by the President of Russia to represent the country in the Asia-Pacific Economic Cooperation Business Advisory Council (ABAC). He has held the position of Chairman of ABAC Russia since 2007. Deripaska is Vice President of the Russian Union of Industrialists and Entrepreneurs, Chairman of the Executive Board of the Russian National Committee of the International Chamber of Commerce and a member of the Competitiveness and Entrepreneurship Council, an agency of the Russian Government. He sits on the Boards of Trustees of the Bolshoi Theatre, the School of Business Administration, the School of Public Administration, and the School of Economics at Moscow State University and the School of Business Administration at St. Petersburg State University. Deripaska is a co-founder of the National Science Support Foundation and the National Medicine Fund. In 1999, Deripaska was awarded the Order of Friendship of Peoples by President Boris Yeltsin. Deripaska is of Belarusian origin and was born in Dzerzhinsk, Nizhny Novgorod Oblast, but he grew up in Krasnodar krai. He graduated with honors in physics from the Moscow State University in 1993, and in 1996, he earned an economics degree from the Plekhanov Russian Academy of Economics. He was general manager of Sayanogorsk Smelter (1994-1997) and held the post of president of Sibirsky Aluminium Investment Industrial Group (1997-2001), which later became a core of Basic Element Investment Company. From a family of successful landlords and lawyers, my job is to continue what my family started. 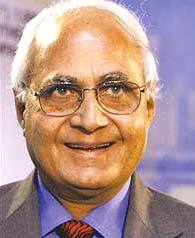 Mr. K. P. Singh, age 78 years is at the helm of DLF. He comes from a family of successful landlords and lawyers. Mr.Singh, a Science graduate from Meerut College is an alumnus of the prestigious IMA, Dehradun. He served for 9 years in The Deccan Horse - a renowned Cavalary regiment of the Indian Army. He left the Indian Army in 1960 to join a family joint venture. Subsequently, he promoted another company, Willard India, for manufacturing industrial batteries in India. In 1961, he joined his father-in-law Chaudhary Raghvendra Singh’s realty business, Delhi Land and Finance. The late Raghvender Singh was no lesser a real estate stalwart having developed 22 colonies in Delhi, including South Extension, Greater Kailash, Panchsheel Park and Hauz Khas. Following the 1957 Delhi Development Act which made land development a state monopoly; DLF had started to lose steam. DLF subsequently moved to Gurgaon which, because of its close proximity to Delhi, began emerging as a potential satellite city. In the years to come, K.P. Singh helped convert this small rural settlement into the magnificent 10 miles (16 km) wide DLF City, which today stands tall as Asia’s largest private township. Ingvar Feodor Kamprad (born March 30, 1926) is a Swedish entrepreneur who is the founder of the home furnishing retail chain IKEA. As of 2008 he is the wealthiest European-born person and the 8th wealthiest person in the world according to Forbes magazine, with an estimated net worth of around US$31 billion. Kamprad was born on a farm called Elmtaryd (now spelled Älmtaryd), near the small village of Agunnaryd in Ljungby Municipality in the province of Småland, Sweden. Kamprad began to develop a business as a young boy, selling matches to neighbors from his bicycle. He found that he could buy matches in bulk very cheaply from Stockholm, sell them individually at a low price and still make a good profit. From matches, he expanded to selling fish, Christmas tree decorations, seeds and later ball-point pens and pencils. When Kamprad was 17, his father gave him a reward for succeeding in his studies. He used this money to establish what has grown into IKEA. Kamprad has lived in Epalinges, Switzerland since 1976. According to an interview with TSR, the French language Swiss TV broadcaster, Kamprad drives a 15 year old Volvo, flies only economy class, and encourages IKEA employees to always write on both sides of a paper. In addition Kamprad has been known to visit IKEA for a cheap meal. He is also known to buy Christmas paper and presents in the post-Christmas sales. While Kamprad's frugality is well documented, it is also an important part of the carefully managed image presented to IKEA employees and the general public. He less frequently mentions that he owns a villa in an upmarket part of Switzerland, a large country estate in Sweden and a vineyard in Provence in France or that he drove a Porsche for several years. While working with furniture manufacturers in Poland earlier in his career, Kamprad became an alcoholic. He has however stated that his drinking is now under control. Rinat Leonidovych Akhmetov (born on 21 September 1966 in Donetsk, Soviet Union) is a Ukrainian business man, multi-billionaire, and President of SCM Holdings, as well of the Ukrainian football club, Shakhtar Donetsk. He graduated from Donetsk National University with a degree in economics in the mid 1990s. According to Korespondent magazine, Ukraine’s Top 50 richest people has Rinat Akhmetov ($31.1 Billion) number one as the richest man in the CIS, as well as the richest man in Europe, outclassing Ingvar Kamprad of IKEA. Rinat Akhmetov was born in Donetsk, of Tatar parents. He became the head of Donetsk City Bank and a specialist in the banking sector. In 1996 he became the President of the football team, FC Shakhtar and has held this post since then. Since March 2004 Rinat Akhmetov has been President of System Capital Management Group(SCM), which he also founded. Akhmetov founded SCM in 2000, and is has grown to be one of Ukraine’s leading financial and industrial firms with revenues of $6.719 billion dollars in 2006. Akhmetov is involved with charities and philanthropies that are often humanitarian, and often to support causes that assist Ukrainian citizens. He founded a think tank called the Foundation for Effective Governance, which has as its goal to create a better government structure for the Ukraine. Among its board members are former U.S. Senator Lincoln Chafee, former Canadian Prime Minister, Kim Campbell and former president of the National Bank of Hungary György Surányi. Another charity he founded, the Foundation for the Development of Ukraine, is stated to be "determined to eliminate the roots of social problems..." in the Ukraine. For example, the foundation donated nearly $900,000.00 to families of victims of gas explosion that tore through an apartment complex in Dnipropetrovsk. It has been reported that The Foundation is planning to spend $150 million to fulfill its programs, and that Akhmetov will be the Foundation's president. Being a son of a well known businessman has a big responsibility on doing your job. 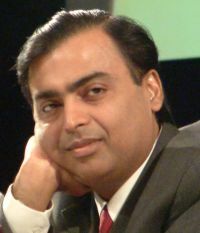 Mukesh Ambani joined Reliance in 1981 and initiated Reliance's backward integration from textiles into polyester fibres and further into petrochemicals. In this process, he directed the creation of 60 new, world-class manufacturing facilities involving diverse technologies that have raised Reliance's manufacturing capacities from less than a million tonnes to twelve million tonnes per year. He directed and led the creation of the world's largest grassroots petroleum refinery at Jamnagar, Gujarat, India, with a present capacity of 660,000 barrels per day (33 million tonnes per year) integrated with petrochemicals, power generation, port and related infrastructure, at an investment of Rs 100000 crore (nearly $26 billion USD). Mukesh Ambani set up one of the largest telecommunications companies in India in the form of Reliance Communications (formerly Reliance Infocom) Limited. However, Reliance Infocom now is under Anil Dhirubhai Ambani Group post the brothers' split.Had the two brothers not split, and Mukesh being the president , his net worth would have been around $85 billion ,making him the richest man on earth ever by a huge margin. Under Ambani's leadership, Reliance has entered retail business through its wholly owned subsidiary Reliance Retail. Under him Reliance Retail has also launched a new chain called Delight stores and also signed a letter of intent with NOVA Chemicals to make energy-efficient structures for Reliance Retail. Ambani owns the Indian Premier League team Mumbai Indians. He has also set up the Dhirubhai Ambani International School in Mumbai. Mukesh Ambani is son of one of the most prominent businessmen in India, the late Dhirubhai Ambani, an Indian entrepreneur and founder of Reliance Industries. 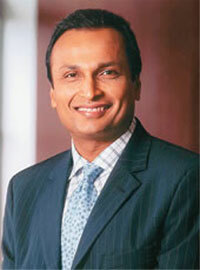 His brother Anil Ambani heads Reliance Anil Dhirubhai Ambani Group with interests in telecom, power, natural resources, infrastructure and financial services. The Ambani brothers had a well-publicized spat after their father's death, which led to the Reliance Group being split between the two. Mukesh Ambani is married to Nita Ambani, who looks after the social and charitable arm of Reliance Industries. They have three children: Akash, Isha and Anant. Mukesh Ambani is currently building the world's most expensive home (valued at $2 billion). This will be a 60-story skyscraper (with only 27 floors) in downtown Mumbai. It may be called Antilia. His family belongs to Modh Bania, a trading community in Gujarat, a coastal province of India. His mother is Kokilaben Ambani. Born in a Rajasthan Agrawal family, Lakshmi spent his initial years in India, living with his extended family on bare floors and rope beds in a house built by his grandfather. His family was from humble roots; his grandfather worked for the Tarachand Ghanshyamdas Poddar firm, one of the leading industrial firms of pre-independence India. His father started a steel Mill in Hardoi, Uttar Pradesh, and nearly 80% of the Mill's production used to be sold through the firm owned by Lala Gulab Chand. They eventually moved to Calcutta where his father, Mohan, became a partner in a steel company and made a fortune. He graduated from St. Xavier's College in Calcutta (now known as Kolkata) with a Bachelor of Commerce degree in Business and Accounting in 1969. 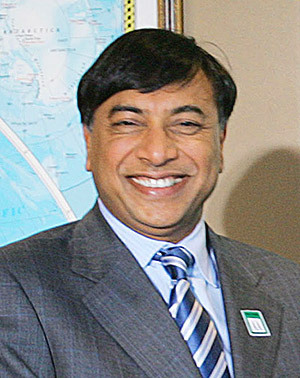 Lakshmi Mittal began his career working in the family's steelmaking business in India, and in 1976, when the family founded its own steel business, Mittal set out to establish its international division, beginning with the buying of a run-down plant in Indonesia. Shortly afterwards he married Usha, the daughter of a well-to-do moneylender. In 1994, due to differences with his father and brothers, he branched out on his own, taking over the international operations of the Mittal steel business, which was already owned by the family. Mittal's family never spoke publicly about the reasons for the split. Helú's father Julián Slim, a Maronite Christian, moved to Mexico City from Lebanon at the age of 14. Julián established a dry goods store called La Estrella del Oriente (Star of the Orient) in 1911 and purchased real estate in downtown Mexico City. He and his wife had six children, of whom Carlos was the youngest boy. Slim is the surname of Carlos' father Julián, who was called Youssef Salim before moving to Mexico, upon which he changed his first name to Julián and altered his surname to Slim. He officially became Julián Slim Haddad by adding Haddad, his mother's surname, according to the Sapanish-language naming customs. 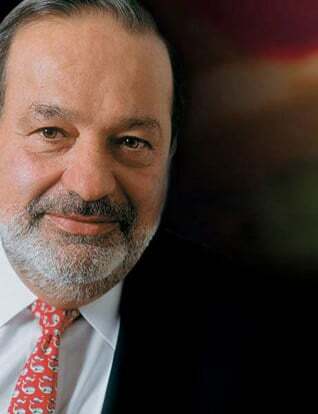 In Western, non-Iberian naming conventions, Carlos Slim Helú's name would be Carlos Slim. Slim studied engineering at the Universidad Nacional Autonoma de Mexico. He married Soumaya Domit in 1967; the couple had six children and were married for 32 years until Domit died of a kidney ailment in 1999. Like his family, Carlos Slim Helu is a Maronite Christian.